My blog is going to veer somewhat away from knitting in the months ahead, and limp into Total Hip Replacement Land. I'll go into a fair bit of detail, as I hope this information may be helpful to others with dysplasia who are heading down this THR path too (hello to all my friends over at Hipwomen!). Never fear, there will still be puppy piccies! As you may know, I've always had crap hips. To summarise (skip this if you've heard it all before!) : I was born with a congenital dislocated hip (CDH, left) which was picked up when I was 20 months old. By the time I was 7 I'd had a failed tendonectomy, two failed open reductions (all done in Australia in 1966-67), one successful and experimental open reduction (by the rather fabulous and innovative Professor Wayne Southwick at Yale University Hospital in 1969), and a (minor) femoral osteotomy in 1973. I've spent months in hospitals, years in double hip spica casts (full body plaster from under the arms to the toes, with a metal bar between the legs to keep them in position), and even longer in uncomfortable braces at night, and traumatised my poor parents, as well as myself. In those bad old days, there was no physiotherapy or much rehab after surgery (something which surprises me in retrospect!). Because my pelvis was so damaged by my surgeries, my pelvic outlet is distorted, and I needed two caeserians for my children, as no baby was ever going to get out - so one emergency in 1988, and one planned in 1991. My pregnancies were difficult, with a great deal of hip pain because of the softened ligaments and so on. After my children had been born, my mum remembered that Prof Southwick had said my hip joint 'mightn't survive pregnancy' - it certainly felt like it came close! I have been able to function fairly well, though, thanks to Professor Southwick, despite my short and turned-out left leg (I was never a sporty type, hardly surprising). As expected, arthritis set in around 12 years ago. With CDH you're generally looking at an early hip replacement. I am not a candidate for hip resurfacing. Professor Southwick said my hip might last for around 40 years, and he was spot on - I'm nearly 45, and it's exactly 40 years from my last major hip surgery. Last year I was persuaded by my physiotherapist and sports physician - and I was extremely reluctant - to see a surgeon to start the process for a total hip replacement. I chose Dr Damian Smith, a lovely young guy who is a specialist in CDH as well as hip replacement, and I've been very happy with him so far - he's made time to see me when I had questions, and has been approachable and sympathetic. And it's just as well, my physio and doctor were perfectly right - 8 months after going on the waiting list for a THR, my left hip is giving me nearly constant pain, I need extra pain killers at bedtime, and I'm back to using a walking stick most of the time. I can't walk far, and stairs, shoes and socks are increasingly a problem. It's impacting on my right side too - my right knee is very painful and often swollen, and my right hip is painful too. This is mostly from the stress of taking over from the left side. My right knee needs to be strapped by my physio several times a week (taped to support it), and I have a slight lift at the outer edge of my right shoe to ease the strain on my right leg. I can't kneel on the ground any more. THR when you have dysplasia is more complicated, in general, than for if you've 'just' got osteoarthritis. In my instance, my bones are unusually small, and deformed, so getting a secure replacement joint is going to be quite a challenge for Dr Smith. However, last time I saw him, dear Dr Smith said some words which I really didn't want to hear, when he was looking at my latest x-rays : You do know your right hip isn't normal, either, and is going to require surgery? Argh! I'm a bit worried that he'll recommend a PAO (periacetabular osteotomy) which is a major and rather bloody awful operation, where sections of the pelvis are cut and repositioned with screws, to create a better hip joint. Very long recovery. But it can get many years out of your own joint / bone, without needing a joint replacement. Still, I'm trying not to think on that part too much, and just get through Leftie's stuff first. I attended the compulsory Information Session for Joint Replacement at Canberra Hospital last week (which I'll detail in my next post), and they can now book my surgery date. Don't know exactly when yet, but should be within a month or two, most likely, and possibly with not much warning. 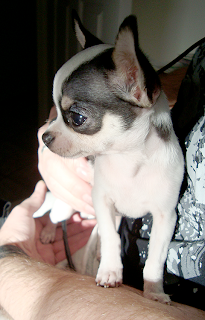 And your reward for getting through all those words, I give you : Petal - 12 weeks old - all together now - aaaaaawwwwwwww! Hugs!! Hang in there! This too shall pass. a big ordeal - but a worthwhile one. We're all here barracking for you! What a gift to us all you are! Thank you for sharing so we can all know more about this not-uncommon surgery. You write so well, it makes the process intelligible and very human. You are brave and deserve medals! Having heard about all that you've gone through in bits and pieces over the years, the full weight of it all is suddenly so crystal clear in this last post - and I feel for you, my dear, so much ... you have gone through so, so much to come to this place. Hopefully, you get through it with flying colors (and strong pain meds help, too). I'll be rooting for you and anxious to hear more as you are coming along. Keep on keeping on - you're our hero! It is your blog, you blog whatever you want to. Additionally, you're educating the rest of us, so keep up the good work. I'll be thinking of you, and taking deep breaths, and hoping everything goes well. Hang in there.